Jewel Foods has gone downhill fast over the past 10 years. There have been significant attempts to remodel and update many of the area stores, but that’s not enough for me. For the prices we are charged for food these days, I expect quality. I have found Jewel’s produce to be of consistently poor quality. I avoid buying produce at Jewel even when it is the most convenient option for me. The last time I purchased fruit and vegetables from Jewel was within the last month. I bought a Spanish onion I needed for a dinner recipe that same night. When I cut into the onion, which looked perfectly fine on the outside, the entire core or center of the onion was a rotten mush. Time-and-time-again, I have had these types of experiences when purchasing produce from Jewel. Dominick’s grocery stores usually have a very clean, updated, and well-maintained interior. This is a premium that I believe is often passed on to the consumer in the price of their groceries. I cannot remember being disappointed with a produce purchase at Dominick’s in recent years. Their fruits and vegetables always appears fresh and lively. It is clearly of better quality (and ultimately flavor) than any of the produce I have bought at Jewel in recent memory. You will pay a premium for the high-quality produce available at Dominick’s. They seem to consistently be the most expensive of the area grocery stores I have visited, but at least you are getting what you pay for. If you’ve ever been inside a Costco store, you know what you’re in for – it’s generally a free-for-all of crazed shoppers fluttering about. There is very little ambiance in a Costco. As for Costco produce, I have found it to be of excellent quality. The prices are very fair for the quality produce they sell. Do not expect a wide-variety of produce though. 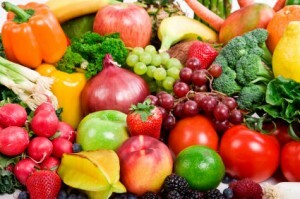 Costco is a great place to buy larger amounts of mainstream fruits and vegetables like broccoli, apples, and lettuce. As is the case with Costco, you pretty much know what you’re getting into when you step inside a Walmart. I have found produce at Walmart to be of decent quality – not great, but not bad either. Their prices are better then the local groceries stores, but I still wouldn’t say they are a value for what you get. Meijer is perhaps a small step-up from a Walmart inside – nothing special. I go out of my way to purchase my produce at Meijer whenever I cook for guests or parties. I am always amazed at the high-quality, flavorful fruits and vegetables I get when I purchase them at Meijer. Even more amazing to me is the vast variety and low-pricing. When it comes to produce, Meijer far-exceeds all the other local grocery store options. What about you? Have you experienced that same with these stores?